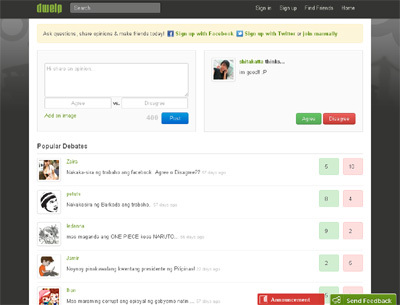 Dwelo is a social networking site where people can hold conversations in the form of debating. It also tends to form a helpful discussion and sharing ideas. It simply allowing users to post opinion or belief in any categories like politics, artists, technologies, religion, travel, etc. Dwelo is also aiming to help users on making decision by asking a question that answerable by yes or no (agree or disagree). It could also give favorable statistical measures between two different parties in a certain opinion. Dwelo is another online discussion that also leads to get the online debating action. Any ideas are allowed but you can only stand at one side, agreeing or disagreeing. Happy debating! Dwelo is aiming to help users on making decision by asking a question that answerable by yes or no (agree or disagree). It could also give favorable statistical measures between two different parties in a certain opinion.